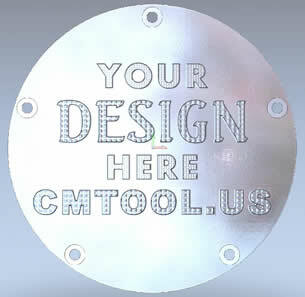 Custom Machine Tool is a custom designing and machining company concentrated on motorcycle parts. Non-motorcycle custom parts will be considered on a case-by-case basis. We offer the ability to customize products unlike any other company has ever offered to the public. If you look at the CGI pictures, you can see what we mean. Those images represent mere ideas and dreams that we transform into something you can see and feel — and, of course, use to dress up your motorcycle. The capability comes from more than two decades of experience in the machining industry, with more than a decade of formal education in the field. We use a wide array of the latest software — including Computer Aided Drafting (CAD), Computer Aided Machining (CAM), and Computer Generated Imaging (CGI) — to design parts for CNC machining. That’s the same technology you find in the aerospace and movie industries. And now our techniques are widely available to the general public. Because we don’t modify existing parts, instead making them from scratch, everything we create is completely one-of-a-kind. When you order a part from Custom Machine Tool, you can rest assured there isn’t another one like it.